What if Dominica was organic? Coconut fatty acids as good as DEET at repelling biting insects. Traditionally especially in tropical countries it is an accepted body care program to oil the body once or even twice a day. Usually it was coconut oil; made at home from coconuts growing in the area. The benefits of this are many but one recent mind blowing study has shown a benefit most people do not think about. Universities from Nebraska; Illinois; China and Brazil working in cooperation with The US Department of Agriculture have found that Coconut Oil is just as repellent as DEET. DEET is an insect repellent that is used in products to prevent bites from insects such as mosquitoes, biting flies, fleas and small flying insects. DEET has some serious side effects. Manufacturers and governments still say it is safe to use but the people who use it a lot are disagreeing. Children are affected the most as usual – The Canadian Government does not recommend using DEET on a daily basis for children younger than 12 years old for more than a month. For infants younger than 6 months old, they recommend not using it all. The FDA does not recomend the use of DEET for children under 2 years old. Mental retardation, muscular hypotonia, hearing loss, and coarctation of the aorta have been reported among infants whose mothers were exposed to DEET during pregnancy; however, a direct relationship between the use of DEET and birth defects has not been demonstrated. They are still looking at the connections of the use of DEET to Gulf War Syndrome. US Veterans who used DEET-containing insect repellents showed signs of arthro-myo-neuropathy, a neurotoxic syndrome with symptoms including joint and muscle pain, fatigue after exertion, and tingling or numbing of the hands, arms, feet, and legs. In 1982 workers at The National Everglades Park in Florida were concerned by the effects they were having from sustained use of DEET and they requested the National Park Service initiate a health hazard evaluation to evaluate occupational exposure to DEET among workers. It was found that more highly exposed workers had significantly higher prevalence of insomnia, muscle cramping, symptoms of mood disturbances,skin rash or blisters, and difficulty starting or stopping the urinary stream. In the 1990’s a ban on any DEET product above 30% was put into place but it was negated by the courts and the companies who stood to make millions from the product. The use of DEET has continued because vector-borne diseases account for 17% of all infectious diseases resulting in 700,000 human deaths annually. Repellents are a primary tool for reducing the impact of biting insects on humans and animals. Universities have done multiple studies to find alternatives to DEET. Studies increased when they found mosquitoes were breeding immunity to the most powerful DEET concoction. Lemon Eucalyptus is one natural product they found that compared to DEET in effectiveness but we will talk about that later. In a cooperative study released in September 2018 that included U.S. Department of Agriculture, University of University of Kentucky, South China Agricultural University, Rutgers University, Center for Medical, Agricultural and Veterinary Entomology and the Universidade Federal de Goiás of Brazil they found that fatty acids derived from coconut oil are inexpensive and highly efficacious repellant compounds. What is mind blowing is these coconut fatty acids are active against a wide array of insects including biting flies, ticks, bed bugs AND mosquitoes. The medium-chain length fatty acids from C8:0 to C12:0 were found to exhibit the predominant repellent activity. Repellency was stronger and with longer residual activity than that of DEET. In laboratory bioassays, these fatty acids repelled biting flies and bed bugs for two weeks after application, and ticks for one week. An aqueous starch-based formulation containing natural coconut fatty acids was also prepared and shown to protect pastured cattle from biting flies up to 96-hours in the hot summer, which, to their knowledge, is the longest protection provided by a natural repellent product studied to date. There is already DEET in our waters and environment and repeated exposure seems to increase the side effects. Science has shown we can use coconut based products instead. Most people who visit Dominica exclaim over and over how green it is! Most of the people who live here say one of the reasons they put up with all the challenges of living on a small island with low incomes is the access to nature. Lucky for me growing up my parents loved to immerse in nature; our most frequent family outing was an experience in nature; visiting a lake or a park for a day or a week holiday. I still remember the feelings of well being after being immersed in nature and the deep refreshing sleeps after. Immersion in Nature is now scientifically proven to be healing! I first learned this concept – nature is healing as part of a conscious lifestyle for health and wellness – in the 1980’s from the Rasta’s I studied during my year’s sabbatical in the West Indies studying Herbal Medicine; Appropriate Technology and Vegetarian Cooking! Repeatedly as I interviewed people who were part of the Rasta Movement and interested in Healthy Conscious Living I heard that Immersion in Nature – gardening; hiking trails; nature walks; river baths; hot water soaks or visits to ‘Dr. Sea’ – was an intricate part of their Healthy Lifestyle. Now Forest Bathing is offered everywhere. Increased ability to focus, even in children with ADHD. Accelerated recovery from surgery or illness. Join us for Hike Fest 2012! Walk in the footsteps of the ancestors. Take this unique opportunity to experience the healing energies of Dominica’s natural areas. Hiking is a traditional way of life in Dominica. Only 100 years ago these same trails were our main method of getting around. In those days if you were from Grandbay, Castle Bruce or La Plaine and you wanted to sell your eggs, milk, or fresh produce in Roseau market you carried it over the paths often during the night cause if you left at dawn you could not get there early enough. 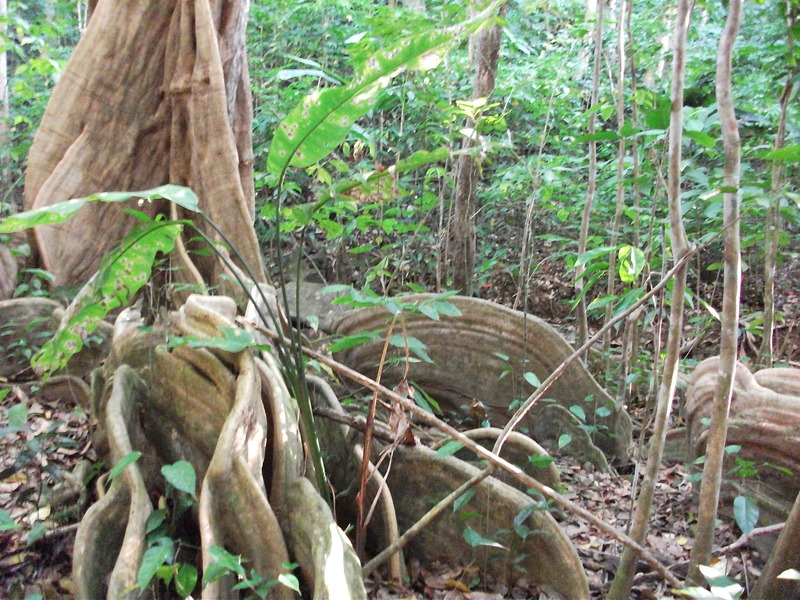 The Carib Indians paved their major paths with stones, you will see an example of this on the first hike of the fest. I love the thoughts of tredding on the same stones as those amazing people, who were so closely attuned to nature and such great navigators. The Maroons, freedom fighters from the days of slavery, mapped the whole island out in trails joining all their villages, at one place called Jaco Flats there was a pulley system built to get big loads down the mountainside. These freedom fighters knew their paths and forest so well, foreigners thought they appeared and disappeared in the forest at will. To this day our school trips are often “Belle Marches”, a much healthier and environment friendly school trip with many educatonal opportunities. The Dominica Hotel and Tourism Association are an amazing example of what people can achieve working together to create a dream. One part of the many ways DHTA promotes tourism here is their yearly Hike Fest. As a visitor or resident this is a lovely opportunity to immerse in nature, explore the trails of Dominica and learn about the island while meeting a mix of people of many ages from Dominica and all over the world. This year DHTA has partnered with the Waitukubuli National Trail, Discover Dominica Authority and various other Hiking Committees and Tourism Stakeholders to plan Hike Fest 2012. Pond Casse to Castle Bruce, ending at Castle Bruce playing field. This trail nestled within the Morne Trois Pitons World Heritage Site traverses the Old Carib Trace – a Kalinago stone pathway that leads through the Emerald Pool and Fond Melle areas. It features the long standing contributions of our indigenous people, the struggles of a resilient people and the value of our forest and water resources. Starting Colihaut Heights and ending in Picard, Portsmouth. This trail traverses old and abandoned farm and estate roads, heavily forested areas and sections of the Northern Forest Preserve. It provides an excellent opportunity to sight the rare Jaco or Sisserou Parrots in their natural habitat. While walking this trail, one can learn about our farmers, about our many trees and listen to the merry sound of our birds. Morne Diablotin National Park is the most popular spot on island for bird watching. Maroons used this trail in the 19th Century! This beach hike with dramatic views of the Atlantic Coastline will commence at Eden on the Sea in Wesley and will end at Cabana on the Londonderry beach. The health benefits of these hikes are amazing. Walking in nature is a proven stress management technique; it releases hormones that fight depression and strengthens our bones and muscles. Hike for Health. I love to meet people, and these hikes are a great way to get to know other people who love nature and being active while exploring Dominica’s nature spots. After each hike there will be a celebration in a nearby village where you can purchase food and drinks. Price includes: Transportation, Water and a Hike Fest 2012 t-shirt!